Are you looking to experience a different side of Germany on your Berlin trip? Well, why not jump on a train and take a day trip from Berlin city to Lubbeanau and explore Spreewald. It’s a wonderful day out and if you have time to fit Spreewald into your Berlin itinerary then I would recommend visiting. Where is Spreewald? Spreewald is situated in the state of Brandenburg, visiting Lubbenau you can escape the city madness of Berlin for a day trip and immerse yourself in Germany’s beautiful nature and wildlife in Spreewald’s natural environment. In 1991, Spreewald was named a UNESCO biosphere reserve, over 400 km of natural and man-made waterways. Since then the plants and wildlife have grown and it’s become an idyllic place to visit by both local and foreign tourists from Berlin as a day trip and further afield. Not only do you get to enjoy the natural beauty and calm of the Spreewald area but you can also experience German traditions from the trying the famous Spreewald pickles (they are delicious) to the local boat postal service that delivers mail to the little islands in Lubbeabau. How cool would that be to get your post delivered by boat! Read about my Spreewald day trip from Berlin to Lubbenau, including things to see and do whilst you are there. Plus if you don’t want to take an organised tour it includes how to get to Spreewald from Berlin. How to get to Spreewald from Berlin (Lubbenau)? Berlin-Lichtenberg is east of the city centre so depending on where you are staying it might be easier to get to Königs Wusterhausen (you can see where it is on the map below) if you are staying west or south of the centre. This takes 30 minutes and leaves from 7.11 am (then every hour). I stayed south of Berlin city centre at Huttenpalast caravan hotel so for me, it was easier to catch a train S-Bahn to Königs Wusterhausen. I also had the Berlin Welcome Card which includes travel within zones A, B and C so now need to buy a ticket for that part of the journey. My return ticket from Königs Wusterhausen (outside Berlin city centre) to Lubbenau/Spreewald cost 17 EUR*. How to book your Spreewald tickets? If you prefer you can book your day tickets online here I personally found it very easy buying straight from the ticket office when I arrived at the station. Königs Wusterhausen is a small station but Berlin’s main station is a lot busier. Have you ever seen this many pickles in one place! Once you’ve got off the train, follow the welcome sign and multicoloured walls out of the station, you already start feeling the love for Lubbenau. On the left is the main train station building. All you need to do is simply cross the road (there’s a Netto/Vodafone shop on the corner) and follow Poststraße for about 10-12 minutes. Down this road, you’ll walk past a green open space with gorgeous wooden carvings on each side of the road. At the end of the road turn right into Ehm-Welk-Straße. You’re now in the main square with a beautiful church, a few cafes and the famous Spreewald metal statues which make for a perfect selfie! Lubbenau is one of those beautiful small towns in Europe that you might not have thought about visiting before! There are a few different options for punting on your day trip. I guess which one you decide on depends on your budget and how long you have to spend in Lubbenau/Spreewald. I went for the 3-hour punting tour, a leisurely trip to the village Lehde, an hour stop off and then return journey. All the punting boats have little benches with tables. Plus I spotted a few umbrellas so don’t let a bad weather day stop you from exploring! Climbing aboard is a delicate operation, it’s a little wobbly but take your time and you’ll stay dry. Passengers are strategically placed to ensure even weight distribution. I ended up sitting in the middle seat between a German couple with their son and daughter-in-law opposite on a day trip to Spreewald. Sharing my boat with local German tourists was wonderful, they were so friendly and even chatted in English with me. I confess my German is not great so it was very kind of them to make me feel so welcome. English tour guides are available; however, as I was travelling solo I was happy to jump aboard with the German guide. The punting tours stop off on the route at little stalls along the waterside. Here you can buy traditional local pickles and wait for it, pickle beer! I promise it tastes amazing on a hot day. Be sure to take some Euros with you as they don’t accept card payments. If you have the chance to visit Lehde village in Spreewald on your punting trip then you are in for a treat. The small village has restaurants or you can simply have a refreshing drink right on the waterfront. So you can sit back, enjoy the sunshine, watching the skilled stand-up paddleboarders, canoeists gliding past you or even the local ducks! My favourite place was the open-air museum at Ledhe. They have wonderfully captured the detail of traditional German village life, including the Sorbs, who have their own Sorbian language and it was so interesting to learn about. There is information in both German and English, plus you might spot a few of the staff dressed in traditional outfits. On the day I visited there was also a wedding in one of the rooms. Wondering if I am going to get lost or not! After my punting trip and some food from one of the many Lubbenau restaurants. 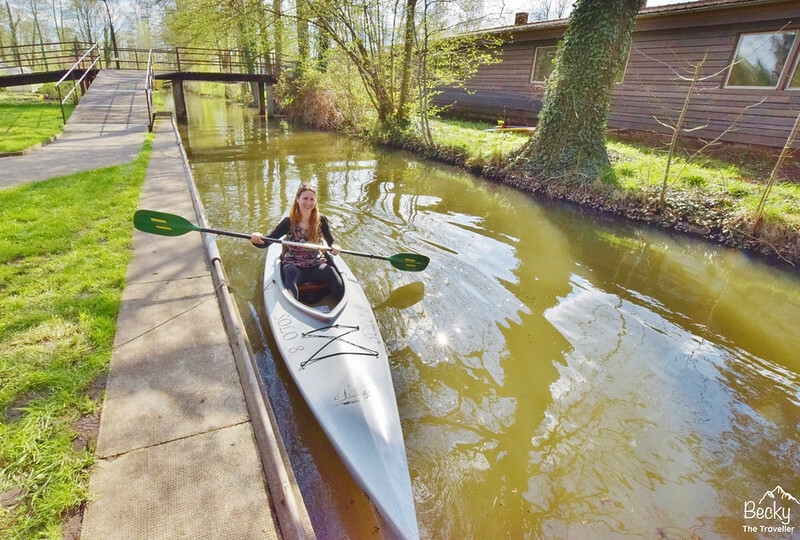 I decided that I was ready to explore the waterways of Spreewald on my own. I had a few hours before the train I was planning to catch at 6.30 pm so I had two options – hire a bike for a few hours or head back on the water in a canoe. As you can see from the photo above I opted for the canoe. Arriving at canoe rental place I asked if they had any canoes for me, at first he showed me a super sporty slimline canoe, great for getting up some good speed. Then when I said I was a total beginner he pointed me toward this larger (and more sturdy model). Perfect for beginners and meant both my camera and I would stay dry! I was given a laminated, hand-drawn map (the official one was on the other side but the hand-drawn one was much easier to follow). As I only had a couple of hours he gave me a route that would take about an hour and a half. Then off on my little adventure. Steering the large canoe took me a minute to work out what I was doing but then I was on my way. Since I hired my canoe later in the day it was quieter than the morning but I also had been recommended a few smaller routes to go down away from the punting boats and these are where I really began to enjoy my trip. Spreewald Biosphere Reserve is a haven for wildlife and nature. The area is famous for kingfishers, although I didn’t spot any on my trip. I saw lots of snakes, both in the water and on land, they were really cool to see both basking in the sun and gliding through the water. 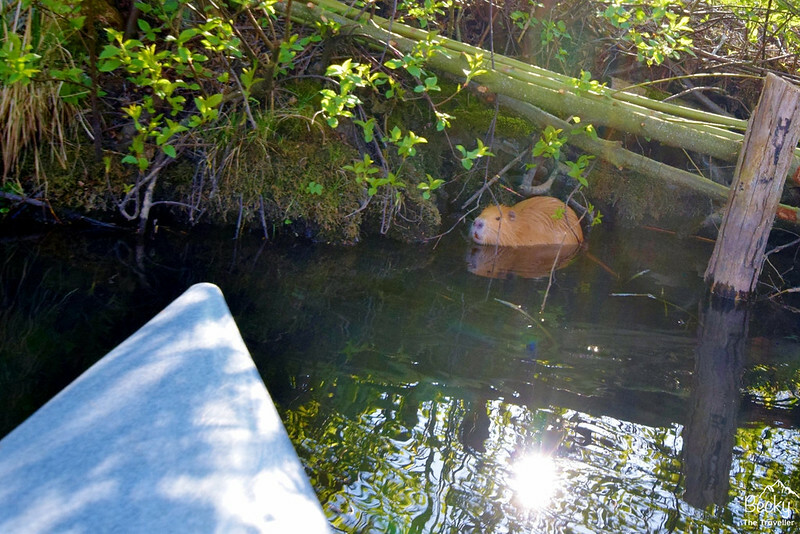 But my favourite wildlife encounter of the day trip was seeing my very first beaver. I was enjoying the peace and quiet in my canoe, then I spotted two floating logs, or were they! I adjusted my eyes and wondered if they were otters but then I realised they were two beavers. Of course, I had to stop paddling to take a quick photo, although my canoe kept gliding in the water and seemed to be heading straight for them. A speedy reaction and the crisis was averted, phew! 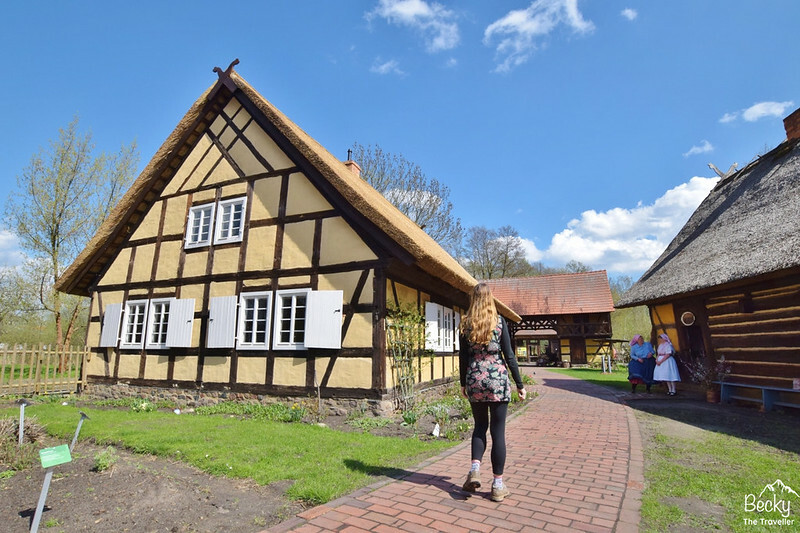 My day trip to Lubbenau/Spreewald from Berlin was recommended to me by fellow blogger Susanna at Wandering Chocobo (including the Spreewald pickle beer!) I liked it so much that now I’d love to recommend it to more people visit. 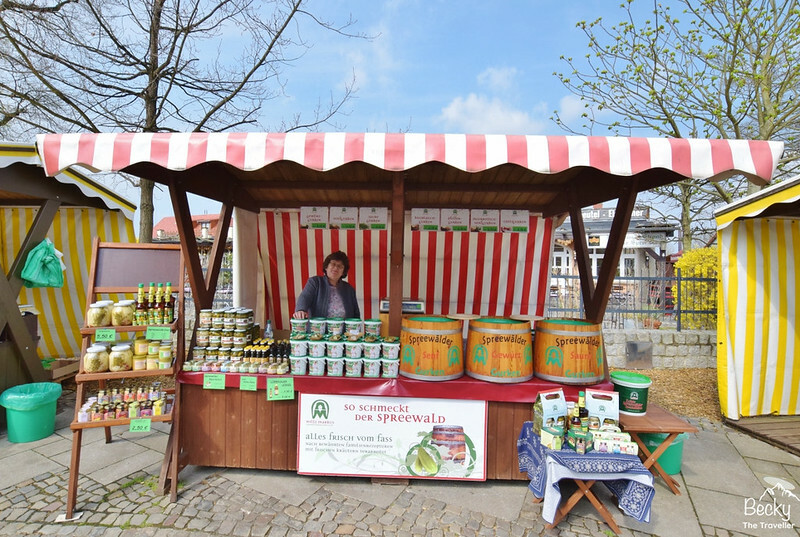 I hope you like my tips, especially the Spreewald pickle beer! I’d love to know if you try it too. 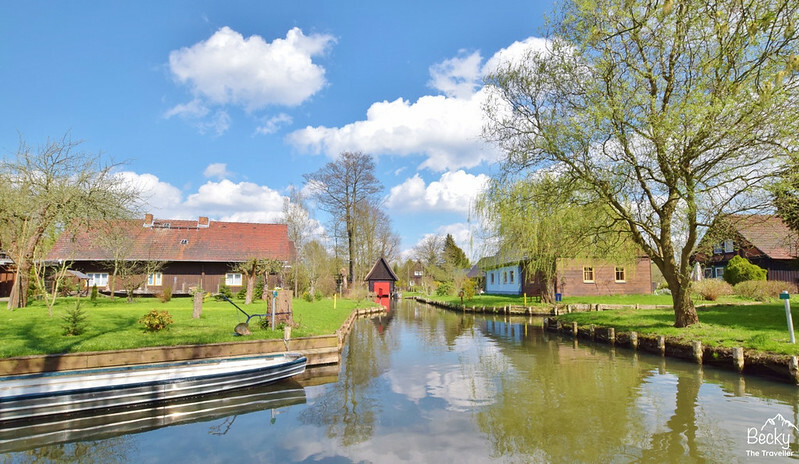 **My day trip from Berlin to Lubbenau/Spreewald was arranged by Tourism Brandenburg. However, all thoughts and opinions are my own. This looks lovely Becky. My husband has done a lot of work in Germany and has promised to show me around some day… might have to put Spreewald on the request list! Thanks for sharing! Do you know if our dog can stay with us during the punting tour? We want to go there in a few weeks.